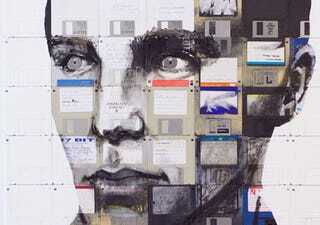 British artist Nick Gentry's paintings give long-forgotten floppy disks a new lease on life. They're still storage media, just in a much more literal sense. At some point recently, you've probably uncovered an old box of videos, cassettes, and floppies in the basement and thought to yourself, "what am I supposed to do with these?" It turns out you just weren't thinking hard enough. Painting on canvases comprised of 3.5" floppy disks and VHS tapes, Nick Gentry puts these bygone forms of storage to use in his art.